Chronic kidney disease (CKD) is associated with a higher risk for stroke in studies from developed countries. This prospective study was conducted to study the clinical profile, management, and outcome of stroke in patients of chronic kidney disease who had been admitted in our institute during the period from December 2004 to December 2006. A higher incidence of stroke was found in men and in the fifth decade of life. Hypertension and diabetes were found in 88.8 and 48.1% of the patients respectively. CKD was detected for the first time during stroke evaluation in 55.5% of the patients. Stroke was due to cerebral infarction in 48.14% and due to cerebral hemorrhage in 40.7% of the patients. Surgical intervention was needed in 14.8% of all patients while stroke was managed medically in the rest. Over 70% of the patients were discharged after they showed improvement in the symptoms. The existence of oxidative stress and the higher incidence of cardiovascular diseases in association with uremia is well proved. The uremic status of serum copper, ceruloplasmin (CP), protein thiols, malonyldialdehyde (MDA), and glutathione S-transferase (GST) levels was studied. The study was carried out on 51 chronic renal failure (CRF) patients who were not on hemodialysis therapy and on 42 healthy controls. 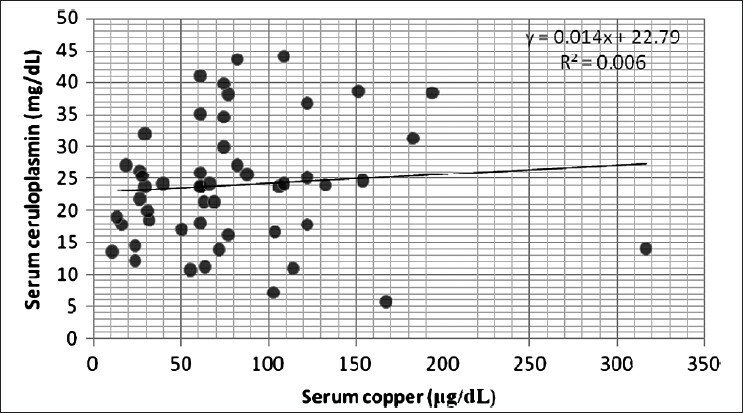 Serum urea, creatinine, and MDA levels were found to be significantly increased ( P<0.001), and total protein, albumin, protein thiols, and copper levels were found to be significantly decreased in CRF patients compared to normal controls ( P<0.001). Ceruloplasmin levels were decreased significantly ( P<0.05), and there was no significant change in serum GST levels in CRF patients compared to normal controls. In conclusion, the significant increase in levels of MDA, and the decrease in levels of protein thiols, CP, and copper in uremia patients when compared to controls, reconfirms the presence of stress in this patient population. In view of the changes in other markers of oxidative stress, this absence of any significant change in the activity of GST in uremia patients compared to controls, warrants further study. Accelerated atherosclerosis and cardiovascular disease are major causes of morbidity and mortality in patients of end-stage renal disease. Carotid intima media thickness is taken as a useful surrogate marker of atherosclerosis. Thirty end-stage renal disease (ESRD) patients were subjected to ultrasonography to study CIMT before the initiation of dialysis. CIMT was found to be higher in ESRD patients than in controls. Levels of a serum marker of oxidative stress were also found to be higher in patients than in the controls. CIMT is an easy, noninvasive, reproducible, and cost-effective investigation in patients with chronic renal failure. Contrast-induced nephropathy is well-known sequelae of iodinated contrast (diatrizoate meglumine). Carbon dioxide (CO 2 ) can be used as an alternative contrast agent. 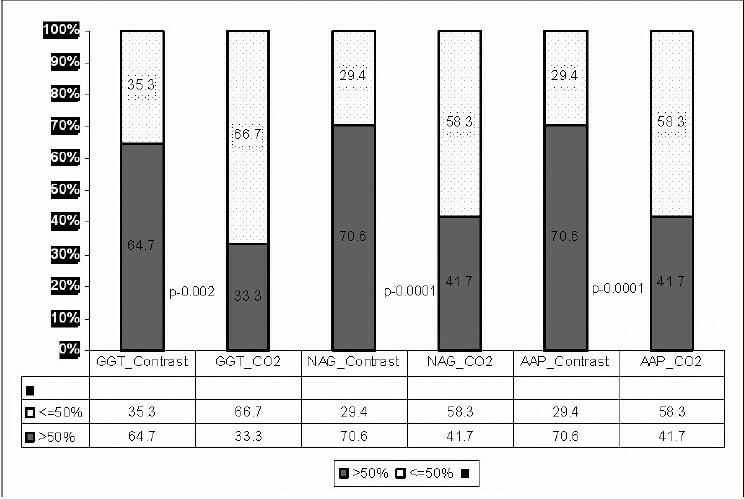 The aim of this study was to compare the renal injury and the quality of images of aortogram using iodinated contrast versus CO 2 using digital subtraction angiography (DSA). This prospective randomized study was done in 29 healthy dogs using DSA aortogram. Dogs were randomly assigned to receive iodinated contrast or CO 2 . 6-F pigtail catheter was introduced via femoral artery approach to perform aortogram under general anesthesia. Serum creatinine (S.Cr.) and urinary enzymes, namely: N-acetyl D-glucosaminidase (NAG), alanine aminopeptidase (AAP), and gamma glutamyl transferase (GGT), were measured before and 48 hours after aortogram. There was no change in S.Cr. in both the groups. Significantly more enzymuria was seen following iodinated contrast than CO 2 . Enzymuria pre and postaortogram following the iodinated contrast was GGT: 14.9 ± 5.92 vs. 26.2 ± 15.1 ( P = 0.001), NAG: 1.63 ± 0.90 vs. 3.6 ± 2.14 ( P = 0.0001), and AAP: 1.51 ± 0.75 vs. 3.38 2.41 ( P = 0.001), and in the CO 2 group was GGT: 15.5 ± 4.9 vs. 21.1 ± 9.04 ( P = 0.02), NAG: 2.12 ± 1.06 vs. 3.82 3.27 ( P = 0.08), and AAP: 1.28 ± 0.76 vs. 2.51 ± 1.72 ( P = 0.03). More than 50% increase over the preprocedural value was significantly less following CO 2 . Images obtained with iodinated contrast were superior to those with CO 2, however, the quality of image with CO 2 was adequate for delineation of the renal artery and major branches. Both iodinated contrast and CO 2 cause significant enzymuria. More severe enzymuria (>50% increase) was seen significantly less with the use of CO 2 . Quality of images is better with iodinated contrast. 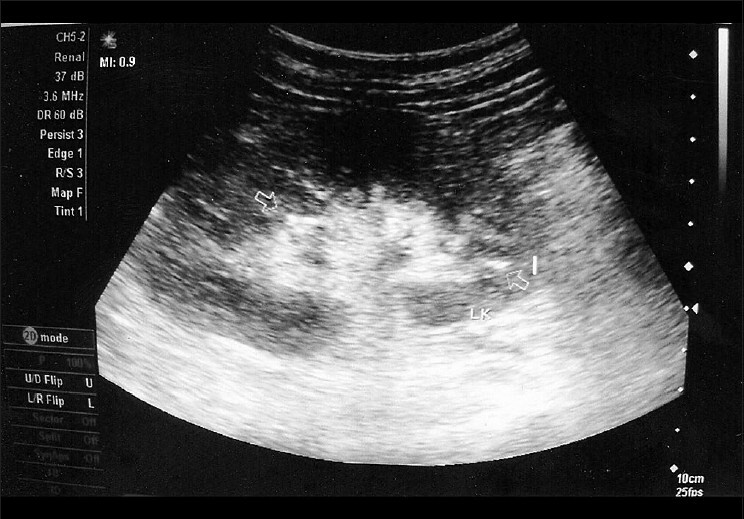 Emphysematous pyelonephritis (EPN) is a rare, severe, gas-forming infection for which the treatment of choice is often an immediate nephrectomy, although many reports exist of conservative treatment of cases with antibiotic therapy and percutaneous drainage of abscesses. It usually occurs in diabetic patients and less frequently in subjects with an obstruction of the corresponding renoureteral unit; other predisposing factors are not common. We report here the case of a 51 year-old woman with a rare association of unrecognized diabetes and bilateral polycystic kidney disease who developed monolateral EPN. She had an emergency right nephrectomy and was admitted to Intensive Care Unit (ICU) for septic shock after surgery, requiring intensive resuscitation. The patient was managed with Coupled Plasma Filtration Adsorption (CPFA). Her clinical conditions rapidly improved and the hemofiltration was soon suspended. Urine and blood cultures were positive for the same Escherichia coli , which was susceptible to all tested antibiotics. The patient was transferred to the Nephrology Division and was discharged from the hospital without further dialysis after 34 days. 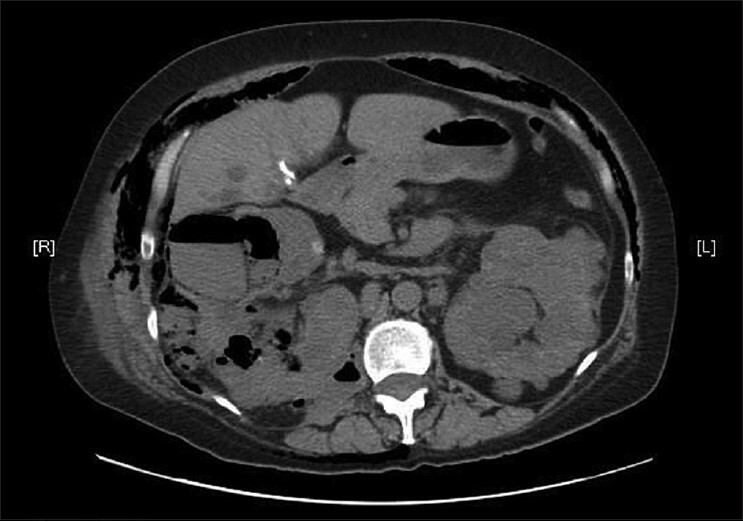 This case report is somewhat unique because of the unusual association between undetected diabetes and polycystic kidney as predisposing factors of a severe infection of the urinary tract. 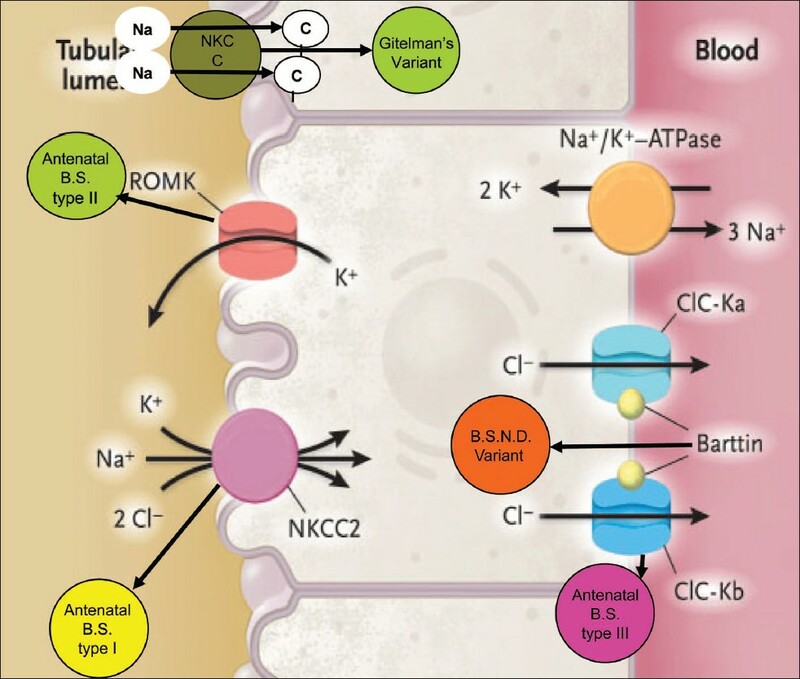 Bartter's syndrome is a group of inherited, salt-losing tubulopathies presenting as metabolic alkalosis with normotensive hyperreninemia and hyperaldosteronism. 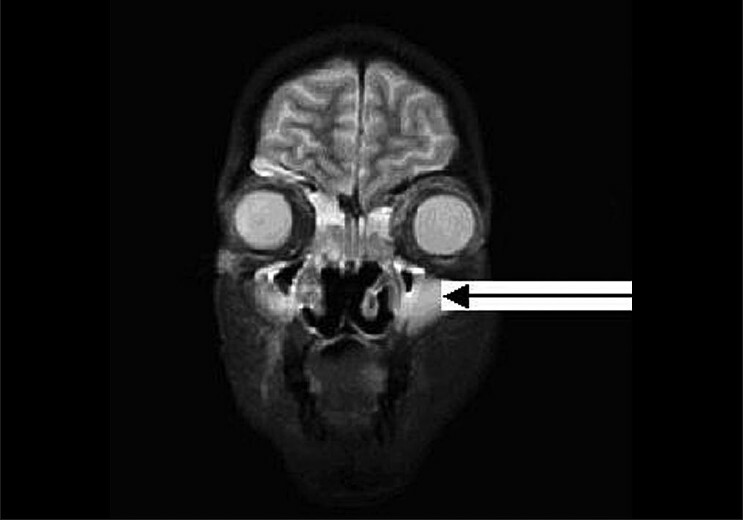 We report here the first case of a neonate with bilateral, sensorineural deafness, a variant of antenatal Bartter's syndrome from an Indian community. A 36 year-old female with chronic kidney failure due to hypertension and who was being treated with hemodialysis for eight months, was admitted to the hospital on the suspicion of being pregnant. Gynecological examination and ultrasound scan confirmed the pregnancy. Gestation was diagnosed in the 29 th week after the patient felt fetal movements. Intensification of the dialysis treatment was started immediately after the diagnosis was made. Invasive fungal infections can cause considerable morbidity and mortality in immunocompromised patients. Zygomycosis is a type of invasive fungal infection with a rapid course and grave prognosis. Renal transplant recipients with concomitant diabetes mellitus are most susceptible to this infection. We report here a case of disseminated zygomycosis ( Rhizopus sp.) in a renal allograft recipient with posttransplant diabetes mellitus (PTDM). This is the first reported case of zygomycosis caused by Rhizopus species. Adenine phosphoribosyl transferase deficiency is a rare metabolic abnormality presenting with 2,8 dihydroxyadenine urolithiasis. 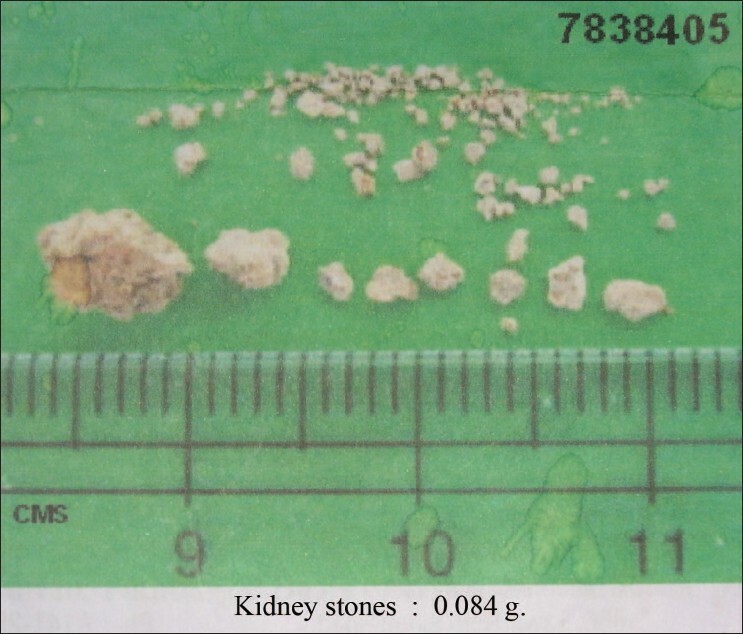 The stones are characteristically radiolucent and therefore need to be differentiated from uric acid stones which are also radiolucent and have identical chemical reactivity. No cases of 2, 8- dihydroxyadenine urolithiasis have been reported from India. We report a 3 year old child with 2, 8- dihydroxyadenine urolithiasis and acute renal failure.